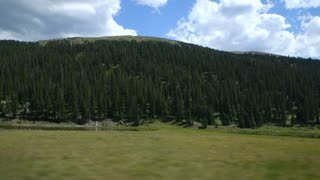 Aerial video of man walking in picturesque valley on green grass towards a river. Drone tracking shot of backpacker hiking in the mountains and hills. Hiker goes to the river. Establishing shot of small town America, Athens, Ohio. Aerial drone shot of a moose cow followed by her two young calves and a bull crossing a blue stream surrounded by green, red and golden autumn forest trees in the Maine wilderness. Bridge leading to Santa Giulia beach hotel resort in Corsica, France, Europe. Holiday on the Beach in Spain in Summer. Typical Mediterranean beach in Summer day. People on vacation on the beach view. Turquoise clear waters during leisure time on the seaside. BARCELONA, SPAIN - AUGUST 04, 2016: Crowd Of People Walking On La Rambla Central Street In Barcelona City. Snowy picturesque street and passing cars dark winter night with electric light. Polar night. Sunrise, Old Harry Rocks, Handfast Point, Isle of Purbeck, Jurassic Coast, Dorset, England, UK. Pan to an amazing view of a red fishing village in the Arctic Lofoten Islands, Norway. MACRO: Lush green palm tree leaves cover up the spectacular sandy shoreline.